Are your kitchen or bathroom cabinets getting worn out, outdated or just out of style? Do they have scratches, nicks and or dings from overall use? Is your cabinet hardware old, dingy, and need updated? Relax don’t panic you have other options then just replacing your cabinets. Give your cabinets a quality refinishing job to make them look great again. 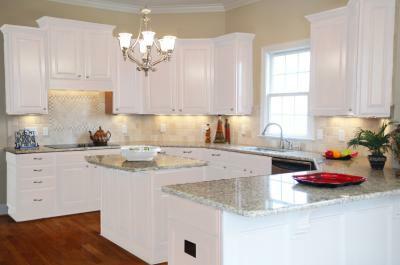 You can receive cabinet refinishers and or refacing services for a fraction of the cost it would be to replace them. You can choose to mimic the look of different types of wood; whether your cabinets are made of oak, cherry, maple, pine, or mahogany no need to worry. Say you like the look of maple but you currently have oak cabinets, with a quality kitchen cabinet refinisher your kitchen cabinets can have a factory finish for usually around half the cost it would be to replace with new cabinets. Highly skilled refinishers can transform your kitchen or bathroom cabinets in less time than you would imagine. At the time of cabinet refinishing you should talk with the refinisher about whether you should replace your existing cabinet hardware. Your cabinets will look like new and will have no more scratches, marks or dents. Cabinet hardware can easily be updated for a new trendy, or modern look. There are many colors that you can choose to paint or stain your cabinets, so you may be able to use a little help from a professional color consultant or designer. They will assist you with you’re your color choices and help you find the right ones for your kitchen. Remove all doors and hardware. Determine whether to replace your current hardware or keep existing. Use Klean Strip3 chemical paint and stain stripper to remove existing varnish and stain. Make sure to use proper ventilation by wear a 3m respirator. Sand all surfaces to be restored with appropriate sandpaper, dust and sweep the area. Wash all cabinets with appropriate cleaner and or solvent. Stain, seal, sand, varnish, sand, varnish. Replace all doors and hardware. Crowder Painting - For all of your cabinet refinishing and cabinet painting needs in the Colorado Springs area.